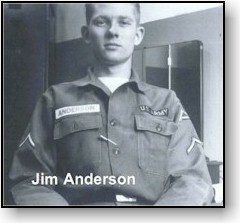 Jim Anderson, from Duluth, Georgia, served with K Troop in Regensburg, Germany. Jim was K Troop's clerk from 1963 while in Germany until 1966 in Ft. Meade, Maryland. Jim has many of his photos taken during his service with K Troop on Facebook. Thanks Jim for your service and for your submission of some very interesting pictures. Note: A Facebook account may be needed to view some of these albums. On Leave in Berlin - 64 just before rotation to Ft Meade, Md.